Please visit my butterfly resource web site at Attracting Butterflies in So Cal. Now that butterfly season is ramping up, this post is longer than most, covering several different topics. Found seven new Monarch cats this week. Looking for various swallowtail cat species on my fennel, dill, Queen Anne's lace, angelica, and common rue; all members of the carrot family, or Apiaceae, - except for common rue, which is a member of the citrus family - on which a few members of the swallowtail family host on. Haven't found any yet, but I did see an unidentified swallowtail cruising past the front of the house last week. Also spotted a Giant Swallowtail flitting about the neighbor's dwarf orange tree. Can only guess it was a female looking to oviposit some of her eggs. The plants mentioned above make wonderful nectar sources on top of being hosts to several swallowtail species here in So Cal. I haven't seen any real nectar gathering on common rue, but that may be due to not seeing this type of activity because of timing: being at the right spot at the right time. Fennel, dill, and Queen Anne's lace host the Anise Swallowtail and Black Swallowtail. Queen Anne's lace also hosts the Giant Swallowtail and possibly the Black Swallowtail. Angelica hosts... I'm not sure yet, as I've only started growing it this year. Makes an excellent nectar plant. Will update. Rue hosts the Giant Swallowtail and Black Swallowtail. Carrot cousins make for strong butterfly nectar magnets and are necessary host plants for swallowtails. Other members of the carrot family you would be familiar with are caraway, coriander, cumin, lovage, and parsley. 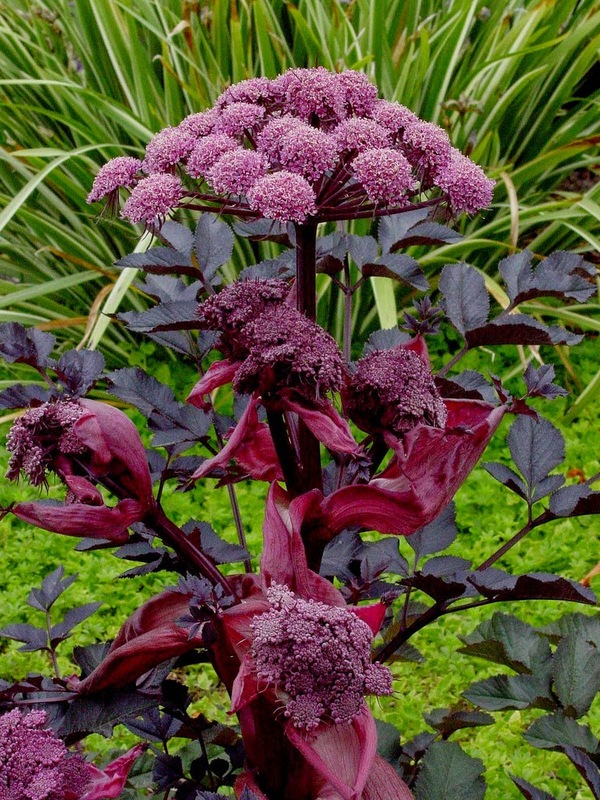 The container garden is host to Angelica stricta "Purpurea", an exquisite beauty of a plant. Well worth looking into if one has the inclination to plant this biennial. Many people plant only milkweed to attract Monarch butterflies, but swallowtails are beautiful guests to gardens too. 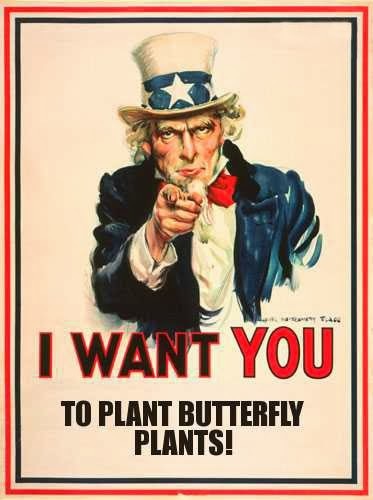 A few representatives of the carrot family would go a long way in diversifying a butterfly garden, plus they are general nectar plants that Monarchs and others likewise feed on. 'tis the season for oleander aphids to start making their appearance on your milkweed plants. These pesky little orange/yellow critters are more of a nuisance and eyesore than anything else, although, if one has severely distressed, sickened, or weak plants, they can succumb to large numbers of them. If you don't find any on your plants, consider yourself very lucky, as they are are pretty much endemic to most of the warmer sections of the U.S. and major portions of the world now. Oleander aphids, Aphis nerii. 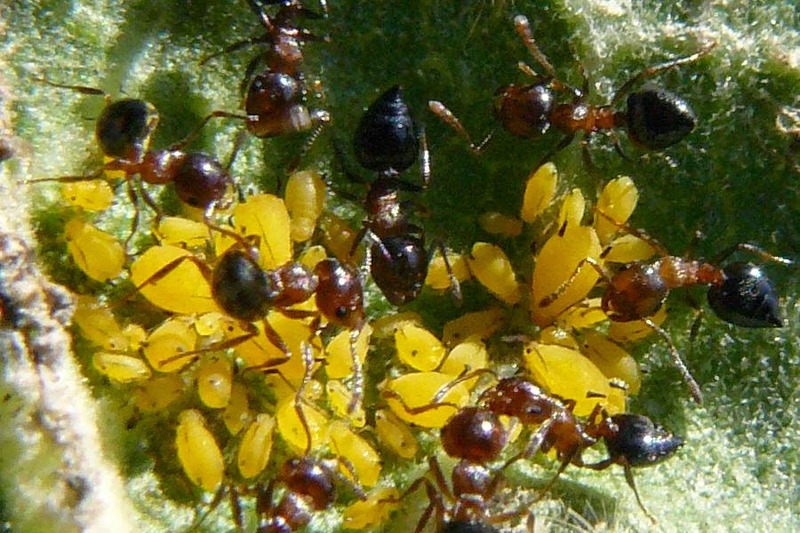 The brownish aphids are carcasses of dead individuals parasitised by a tiny wasp. It is an import that most likely originated in the Middle East where its namesake oleander is native of. It is very host specific, only feeding on a few garden plants here: oleander, milkweed, and hoya are pretty much it. Fear not, as they won't invade other plants one has in surrounding areas. 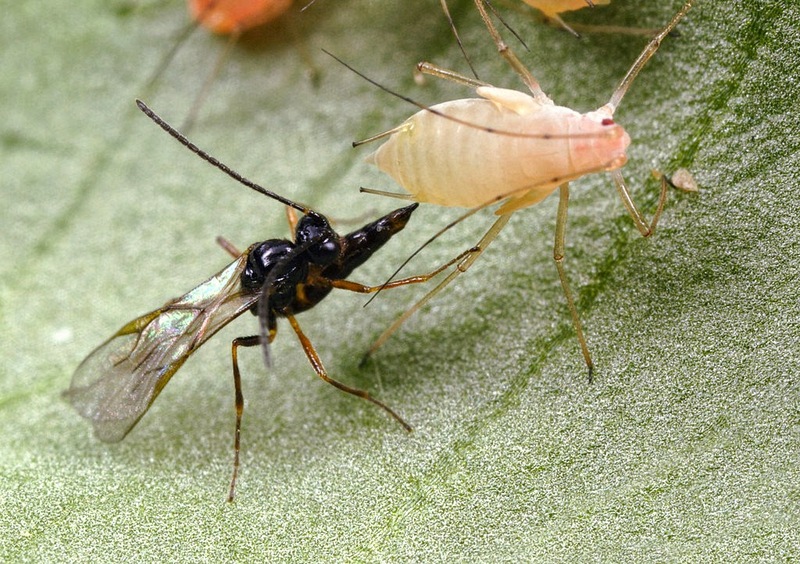 Tiny wasp parasitising an aphid by injecting a tiny egg in the aphid's body that will hatch to eat its host from the inside, out. What's a person to do? Certainly not spraying for them, as that will kill any butterfly eggs or caterpillars that may be inhabiting your milkweed, and threaten any butterflies one wishes to attract. The best method is to practice mechanical and biological deterrents. If one has the inclination, one can squish the bastards little darlings between the thumb and forefinger. 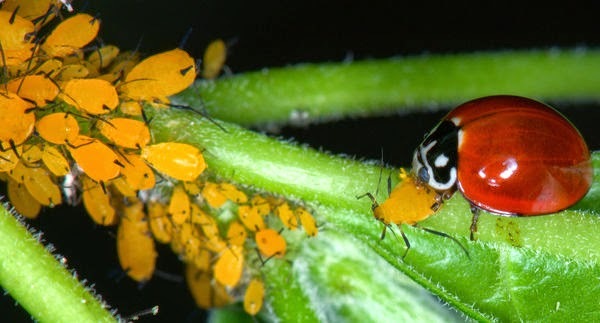 It's best to let nature take its course, allowing aphid predators to help put a dent on their populations. This ugly creature is the nymph of a cute ladybug. Ladybugs and their nymphs feast on aphids. Adult ladybug, or ladybird beetle as some call it, contentedly munching away on a soft bodied aphid. In our warm weather area, we are cursed with another unwanted introduction, the Argentine ant. This little bugger invades gardens and homes and is quite pernicious. They actually round up and cultivate aphids for the honeydew they exude from their bodies, milking them as we do cows. 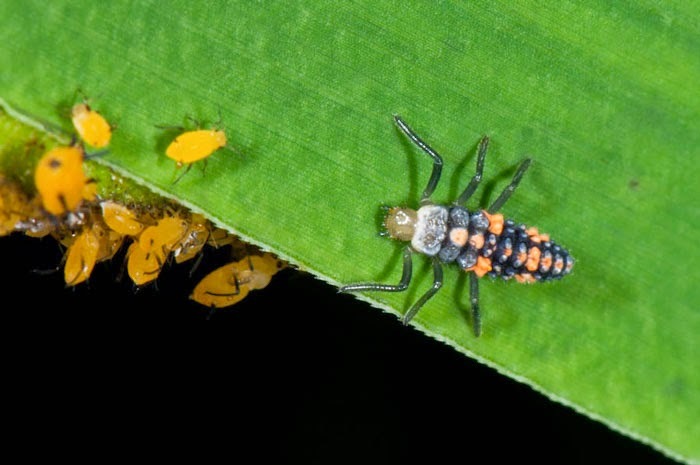 Fierce protectors, they are able to fend off most aphid predator attacks. Bad juju. 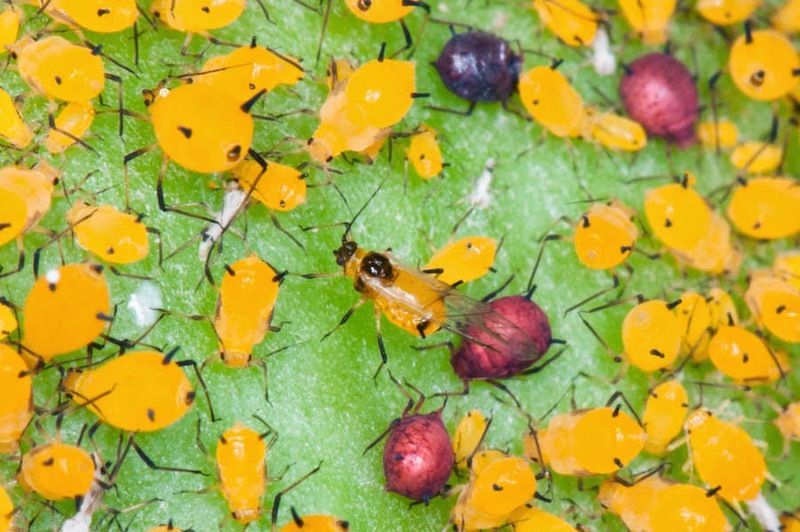 In order to allow aphid predators to do their thing, one must first eliminate Argentine ants from the garden - or at least on one's plants. In summary, eliminate or severely curtail the use of pesticides, allowing a natural balance to rule your yard. I do believe in the localized and restricted use of pesticides when all other options have expired, but then allow nature to once again take over. If you have an ant problem, target them and not the whole yard. There are baits one can place in the garden and house that ants will collect and take back to their colonies which in many instances kills off the colony, or at least severely limits their populations and destructive capabilities. Milkweed in the container garden is beginning to attract oleander aphids. I do see ladybugs and I've done my share of squishing, and hopefully, predatory wasps have spied them too. Eventually, I'll throw in the towel, stare at the myriad maddening mass of orange/yellow aphid bodies, safe in the knowledge that my Monarch cats are well, my environment is healthy, and biodiversity rules this little corner of God's green earth. Two relatively close So Cal butterfly exhibits that are active at the moment are the ENC Native Butterfly House in Newport Beach, and the Rancho Santa Ana Botanic Garden Butterfly Pavilion, located in Claremont, California. The butterfly vivarium at Butterfly Farms in Vista is fully now open too. © Andrew Kliss. Simple theme. Powered by Blogger.